SO YOU ARE TRYING TO TELL ME THAT…..
A lot of crap has gone down in the sports world of late, especially locally, that makes absolutely no sense. So help me out on a few of these items. SO YOU ARE TRYING TO TELL ME THAT…. …at 11:00am Tuesday Ben Roethlisberger didn’t have a concussion. But by 12:05 pm he did? : Everyone in Pittsburgh had a good laugh at this one. Ben Roethlisberger removed himself from the Seahawks game in the fourth quarter Sunday after taking a nasty blow to the head. At his Tuesday press conference, Mike Tomlin announced that Roethlisberger was diagnosed with a concussion and that he remained in the NFL concussion treatment protocol which he originally entered Sunday. Now I’m no @ProFootballDoc. I can’t diagnose other people’s injuries on twitter from my couch 3,000 miles away without examining them. I don’t have those kinds of medical super powers that he has allegedly been blessed with. In other words, this was Ben trying to massage the message so that he and the team didn’t have to be hounded by questions all week about him being in the protocol. The narrative has become that Roethlisberger didn’t know the test results when he popped off and had everyone believe that he had passed the test. 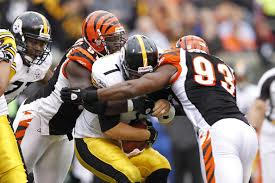 Kudos to the Steelers and to Tomlin for coming clean and admitting their QB had a concussion. We are all a little concussion crazy these days. Especially here in Pittsburgh (see- Crosby, Sidney & Letang, Kris… and Ben 3 or 4 previous times). Oh, and Will Smith does have that movie coming out. I know, it’s a little art house project, you haven’t seen much publicity for it I’m sure (said in most sarcastic voice possible). But can’t we be adults about this? Somewhere between Big Ben telling little white lies and nanny-stating all of pro sports, there’s responsible response. Isn’t there? And didn’t we see it in action? The guy got hit in the head. Got up. Showed no signs of a concussion. Kept playing. Played well. Came to the sideline. Honestly self reported. The team responsibly removed him. He has no symptoms. He’ll continue to be monitored. If he’s symptom free by the end of the week, he’ll play if he wants to. If he is still showing symptoms, he’ll be benched. Concussions are scary and nebulous. But we don’t have to treat everyone as if the player who has been affected needs to retire on the spot. Rules are in place and they have been followed. Roethlisberger’s double-talking explanation suggests he’s more afraid of the public reaction than the brain trauma itself. And that may be the most troublesome part of all this. …Mike Tomlin “doesn’t live in his fears.” But he is afraid to go for touchdowns in important situations? : Yup. Mike adores that phrase. Even spouted it off on national tv before charging into the locker room at halftime in Seattle. He almost tore a rotator cuff patting himself on the back going for that “gutsy” two point conversion in the first half. Yet for a guy who wants to portray himself as the Tin Cup of NFL coaches, he laid up for short field goals twice in the second half en route to a loss. On Tuesday instead, Tomlin told us he wanted to “take the bird in the hand” with the easy field goal to pull Pittsburgh within two points late in the game. “Bird in the hand” is pretty much the direct opposite of “not living in your fears”, isn’t it? …someone actually printed a trade rumor that suggested the Penguins would be dumb enough to trade Evgeni Malkin for Staal? : No. Not Jordan Staal. Stan Fischler isn’t that crazy. With just nine points in 24 games, I’m not sure if the Pens would trade a used Malkin jock strap for him at this point. But Fischler did actually write that a Malkin for Eric Staal trade is possible. 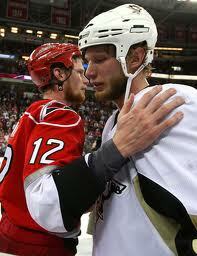 Look, we all know that former Hurricane and current Penguin GM Jim Rutherford loves himself some Staal DNA. But he’s not so senile yet that he’d actually execute this trade. But Fischler’s senility has come into question for advancing this notion. Malkin is finally playing exactly the way the Penguins want him to play. This team is more his than at any point is his career while Crosby has also been healthy. Geno has been the team’s best skater. And he’s under cost control until 2022. Eric Staal has barely been better than his brother (14 points) and is a free agent after this year. …John Tortorella believes the Penguins “whine” so much that the rest of the league can’t? 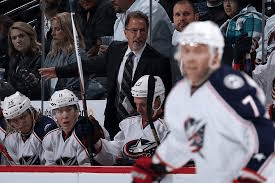 : That was Torts’ assessment in the wake of the NHL suspending Brandon Dubinsky a game for “riding his stick up the back” of Sidney Crosby last weekend. You say tomato. I say tomato. Dubinsky says “stick riding up the back.” Pittsburgh says assault with a deadly weapon. So I guess, Torts, you’ve created a little room for yourself to whine. Did you cross check anyone in the head to do so? …a major college institution is making football coaching decisions based on public opinion? : By all accounts, LSU was set to fire football coach Les Miles after the regular season finale against Texas A&M. But after that story leaked out, there was overwhelming fan support in favor of Miles. Almost as overwhelming as the venom towards him in previous weeks. You know, from a lot of the same people. So according to Joe Schad of ESPN, the athletic administrators at LSU actually changed their minds about firing Miles in their suite after the third quarter of the game. So you gave the thumbs up to a 15 million dollar buy-out because “Geaux Tigers” fans bullied you into it. Then you flashed the red light because a few corn dog eating fans brought a couple nice signs about Les and chanted his name?! Talk about spineless. What happens if the Tigers lose their bowl game. Is he going to get canned again? …college football teams may get to go to Bowl games based on GPA? : Speaking of bowl games, I’ve always said there are too many. Here’s proof. There aren’t enough .500 D-1 college football teams to fill the slots. Check this out from Fox Sports.com- “The NCAA Division I council approved a plan Monday that will make teams with 5-7 records eligible for at least two bowl bids — and as many as five — based on their Academic Progress Rates. The council approved a recommendation made by the football oversight committee that was necessary to fill the record 40 bowls after not enough teams met the standard bowl-eligibility requirements. So grade point average is now determining which schools are going to distract their student athletes from finals and classes with practice and travel in an effort cash piddly checks from relatively anonymous mid range bowl games? Hypocrisy, thy name is spelled N-C-A-A. …..we’ve been chanting the wrong name at Heinz Field the whole time? : During his opening injury report at his Tuesday press conference, Mike Tomlin casually referenced “Earl” Miller’s injured ribs. “Earl” is Heath’s given name. 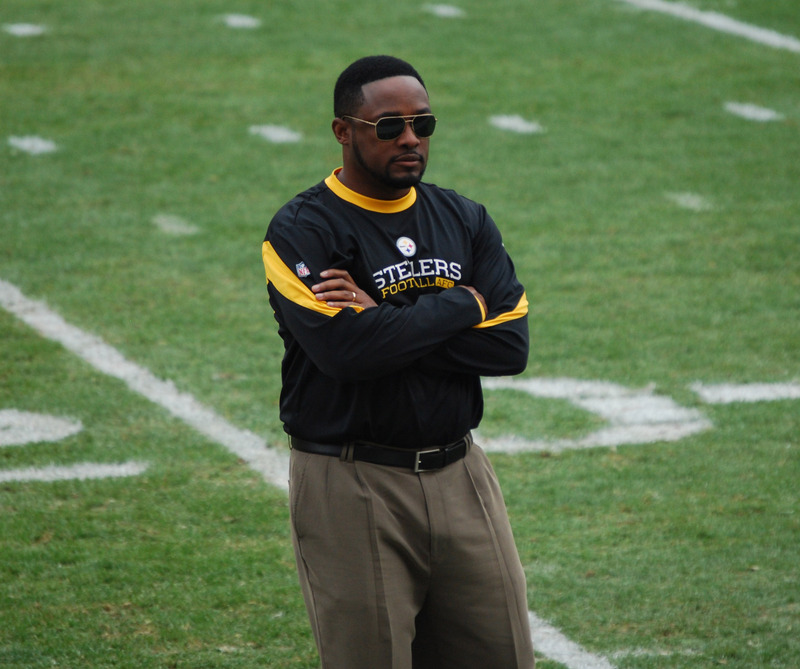 Which leads to an interesting dilemma for Steelers fans at Heinz Field whenever Hea…uh… Earl returns to action. What name do they chant whenever any player of caucasian descent wearing black and gold catches the ball?